- Antibiotic use: Antibiotics seem to be prescribed for everything these days, especially when they are not needed (i.e. in cases of the common cold, the flu, bronchitis, most sore throats, and many ear and sinus infections). Every time antibiotics are taken, they kill all the bacteria—even the “good” kind. Over prescribing antibiotics will also cause antibiotic resistance, which means the antibiotics don’t only kill the “good bacteria,” but they may not even help in cases of bacterial infections. - Fermentation: Small intestinal bacterial overgrowth (SIBO) is a carbohydrate intolerance condition induced by bacterial overgrowth in the small intestine, large intestine, and stomach. Any carbohydrate will ferment by the “bad bacteria” and produce toxic waste products as a result. - Chronic stress: Chronic stress will increase hormone levels, and this also highly impairs the immune system, which creates an environment in the GI tract that is susceptible to dysbiosis. - Poor diet: A poor diet is another major factor in dysbiosis. 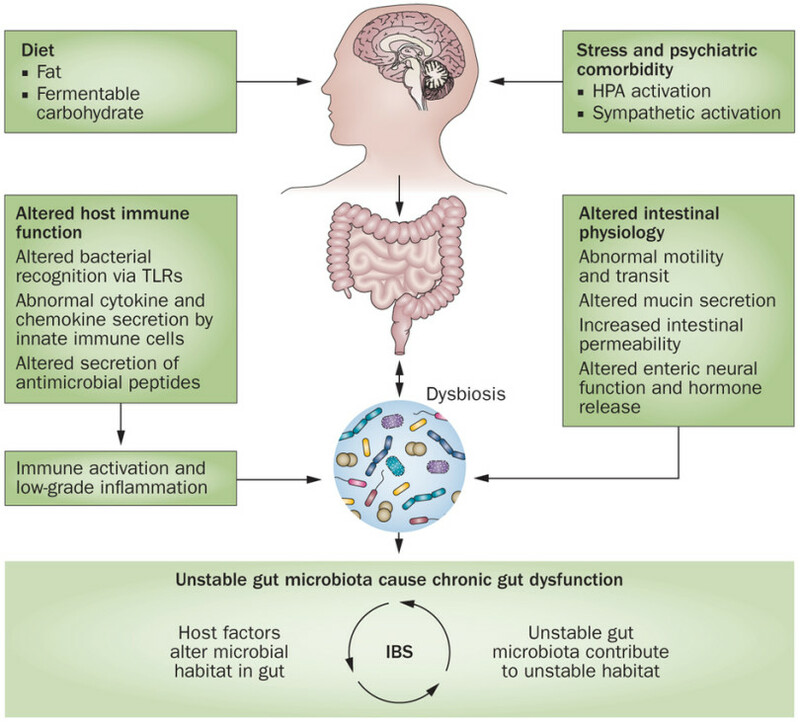 Low-fiber diets, high-fat and high-protein diets, and diets high in sugar and processed foods can slow down gut motility, and also often lack nutrients necessary to nourish and repair the digestive organs, including the GI tract. Candida is a type of yeast that lives off sugar and processed foods, which highly disturb the balance of organisms in the body. Gluten sensitivity is also a factor in dysbiosis. - Environmental factors: Environmental factors that influence dysbiosis include contaminated food and water, exposure to manufactured chemicals or toxic metals, the presence of fungus or mold in the home, and living in a foggy or damp climate. Right away let’s make something clear. 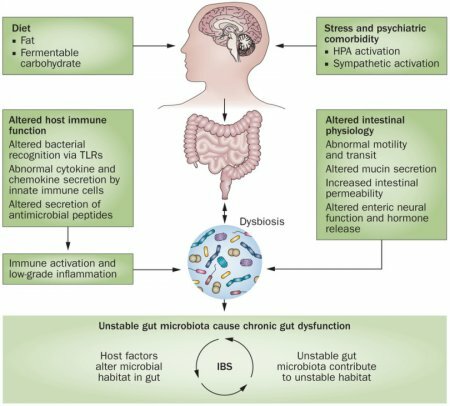 Dysbiosis is often suspected when the patients have a food intolerance or allergy, unexplained fatigue, malnutrition, neuropsychiatric symptoms, breast or colon cancer, or inflammatory, autoimmune, or gastrointestinal disorders. You should also seek help if you regularly experience lots of digestive problems like gas, bloating, or diarrhea. The most useful diagnostic test for dysbiosis is called a comprehensive digestive stool analysis (CDSA). The CDSA will include a number of procedures such as biochemical evaluations of digestion, evaluation of bacterial microflora, detection of abnormal mycology, evaluation of intestinal absorption, and the detection of metabolic markers of intestinal metabolism. From these tests, excessive triglycerides, meat, vegetable fibers, fatty acids, or cholesterol may indicate gut dysbiosis. Severe dysbiosis cases may also result in abnormal blood tests that indicate low levels of vitamin B12 and folic acid, and malabsorption of proteins. Other tests used for dysbiosis include the breath hydrogen test, candida testing, the Genova IP test for leaky gut, u-biome tests to offer a bigger picture of the bacteria in the body, and zonulin testing. Zonulin is a protein that is commonly implicated in leaky gut syndrome and levels will often be high.